Trend Creation case studies: we currently have 8. McNeil Nutritionals, a Johnson & Johnson company, was looking for the most effective way to test market Splenda Mist, a spray form of Splenda No Calorie Sweetener. In order to drive awareness among the target consumer (women 25+), facilitate sampling of and solicit feedback on the product, the Splenda Brand turned to Facebook. Splenda utilized Facebook advertising, marketing, and developer platforms to create the first-ever product launch and sampling campaign on Facebook. The resultant launch on Facebook exceeded all Brand expectations, demonstrating the power of Facebook as a highly effective tool for driving consumer engagement and feedback. Sephora turned to Facebook to increase brand awareness and strengthen their position as a leader in the natural and organic makeup category. The solution Facebook provided was through its Virtual Gift Engagement ad, which was a branded reusable shopping tote for users to give to their friends along with a message. Those who sent the virtual gift were awarded a promotional code they could redeem, with any Sephora.com purchase, for a real, limited edition tote bag. During the campaign, Sephora gained 10,274 new fans and orders and traffic to Sephora.com more than doubled. Wendy’s wanted to increase awareness and drive excitement around the launch of their new ‘Flavour Dipped Chicken Sandwich’ in October 2008. 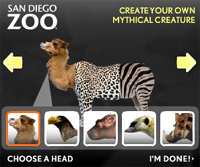 The solution was provided by Facebook in the form of an engagement ad: the virtual gift. This allowed users to send a virtual ‘Flavour Dipped’ sandwich with a personal message underneath. The result was a boost in awareness for the brand with over 191,000 gifts given in the first week; as well as buzz creation, with discussions about ‘Wendy’s’ rising 60% while the gift was available. For its tenth birthday, web hosting company Moonfruit, gave away a Macbook Pro laptop every day for ten days. 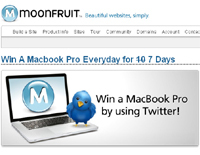 To win one, users had to tweet using the hashtag #moonfruit. The result? A 350% increase in product trials, a 600% increase in traffic… and Twitter forcibly removing it from the top trending topics. The hashtag #moonfruit topped Twitter's trending lists for three days, accounting for 2.5% of all tweets at its peak. People drew pictures, made videos and sang songs about the brand in a bid to win the laptops. The secret to the success of the campaign, spearheaded by founder Wendy Tan-White, was engagement. "The biggest surprise was the brand affinity and awareness it created. The name of the company helped a lot, because people asked what it meant. They really picked up on the message we wanted to get across. They made the brand their own and we couldn't have done that without Twitter. It creates a relationship," Tan-White said.